From my point of view, this question is not high quality nor a good subject for a audit. Who flags question to be usable for audits? What kind of consequences does failing one have? Audits are completely automated. They'll pick "known" good or bad posts (based on previous actions) and test you. There are also some random insertion tests in the suggested edit queue. This was one of the known good posts, to catch people who are trigger happy with closure. There's nothing I can do to remedy you having fallen into this one, but we can work on improving the question to make sure future reviewers don't have the same problem. I'll edit it up but contribute if you feel you'd still vote to close it. And just a reminder: the odd failed audit isn't the end of the world. There are much trickier ones than this and I think all the mods have at least a few failed audits on record. The system only takes notice if you fail many within a period of time. I decided to flag it for closure because the problem had "gone away". "This describes a problem that can't be reproduced" -> the problem is reproduceable on a default installation or by enabling "Reference" if previously disabled. 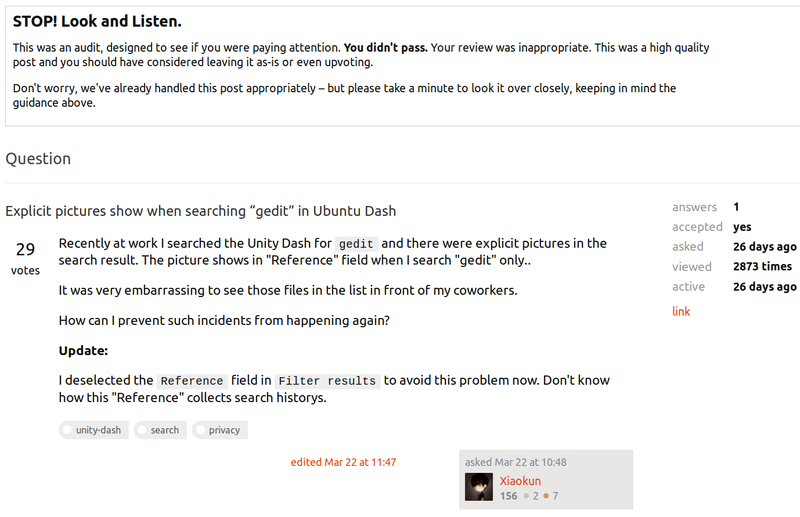 "that seemingly went away on its own" -> it didn't went away on its own, OP had to disable "Reference". "It's off-topic as it's unlikely to help future readers" -> it'll most likely help anyone else with the same problem. However I agree some reviews are tricky / misleading / inevitabily lead the reviewer to fail. In this specific case the system did the job well, but only for coincidence. Whatever initially apparently weird (read as in "interesting") question may get a number of upvotes high enough for it to become selectable for an audit even if the real problem is something pretty dumb like a typo, however that specific case is (luckily) pretty rare. So you have a point. +1.